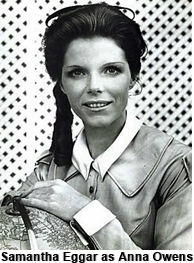 Anna Owens (Samantha Eggar) is a rather straight laced English teacher who is hired by the King of Siam to tutor his children. 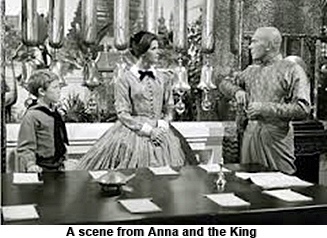 Anna is a wonderful teacher to the children but she can’t seem to keep her place with the King and Siamese society. 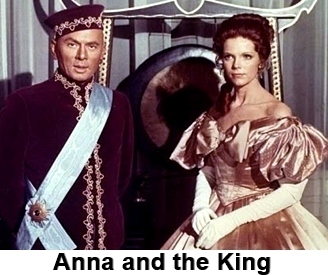 In fact Anna and King Mongkut (Yul Brynner) have different views on almost all of the things that the King takes for granted. Despite her insolence the King grows to respect and love Anna. This show has quite a lineage. It starts in 1944 as a semi-biographical novel Anna and the King of Siam written by Margaret Landon. Then in 1946 Hollywood makes it into a movie starring Rex Harrison as King Mongkut. Along come Rodgers and Hammerstein who in 1956 write a wonderful score and produce it as a musical for Broadway starring Yul Brynner and calling it The King and I. The play runs for three years (a huge success for any play at that time). Don’t count Hollywood out just because it’s already been a movie, in 1956 it’s remade into a movie musical starring, you guessed it, Yul Brynner who it turns out has a wonderful voice. After the failed attempt at the TV show (13 episodes is considered a failure) several touring theatrical productions pop up with Yul Brynner in the starring role when his movie schedule would permit. It’s remade into a movie again in 1999 starring Jodie Foster but no Yul Brynner. 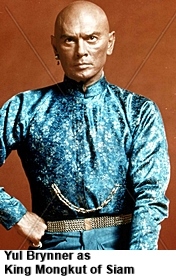 Yul Brynner played King Mongkut of Siam in 7 different theatrical productions of The King and I as well as the movie and television versions. 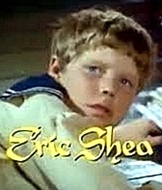 This is a record that stands today as well as having appeared as the same character 4,625 times on stage. He was touring with the show when he was informed of his diagnosis of fatal lung cancer.